Will you help us reach out widely? We just learned that technology and You Tube are not perfect. I know, it was a rude awakening for us too. Darn it. We had over 90,000 hits on the TWO SPIRITS trailer, which we intentionally created to work like a public service announcement so that anyone who saw it could understand something about gender with a difference. One day all of those hits and comments just simply disappeared. This has an impact on how high the trailer ranks on search engines and all sort of other things we may or may not understand fully. Please share links to the trailer and post it on social media so that we can continue to reach more people with the messages of TWO SPIRITS. Thank you so much for your support! What the Hell Happened to Traditional Values Like Love? We’re in the Holy Days of the LGBT calendar in October and November. It’s the season we observe National Coming Out Day, LGBT History Month, and Transgender Day of Remembrance. 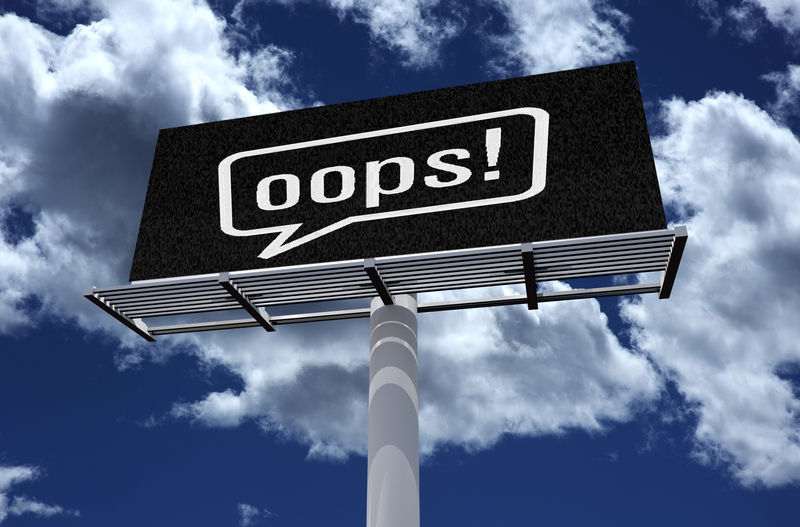 I’m embarrassed to say that 20 years ago I felt squeamish when a close family member and her partner came out. Thank heaven for atonement and forgiveness! I knew so little at the time and I had no idea how to help them counter the discrimination they faced. 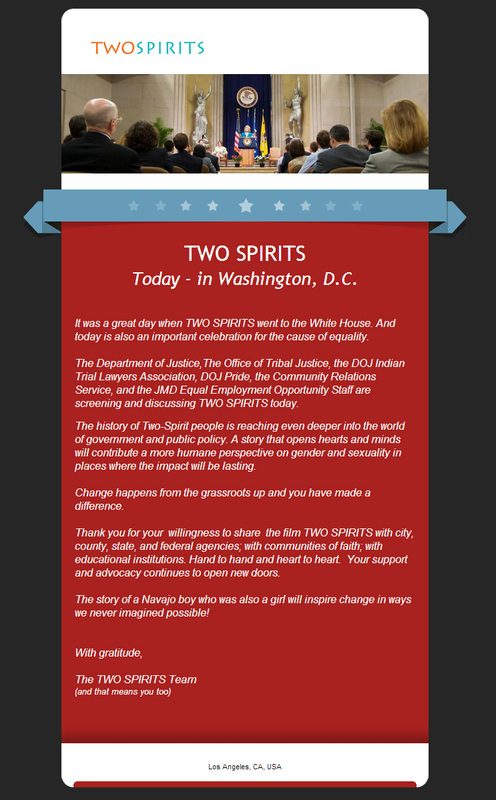 TWO SPIRITS in the White House! 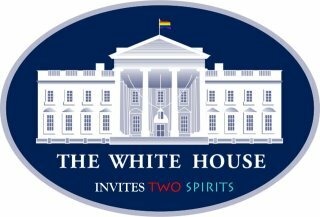 TWO SPIRITS has been invited to the White House for a special event on June 15th with President Obama in celebration of LGBT and Two-Spirit people! We’re going to have even deeper impact now. TWO SPIRITS director, Lydia Nibley was honored to be featured in the University of Southern California’s Visions and Voices initiative at a day-long event featuring films and a discussion to examine the intersections of race, ethnicity, gender and sexuality. PBS has submitted TWO SPIRITS for consideration for the Peabody award. It’s an honor to be in such fine company. We’ll keep you posted. Here’s a very thoughtful interview from the RadioWest program heard nationally on Sirius XM Public Radio. 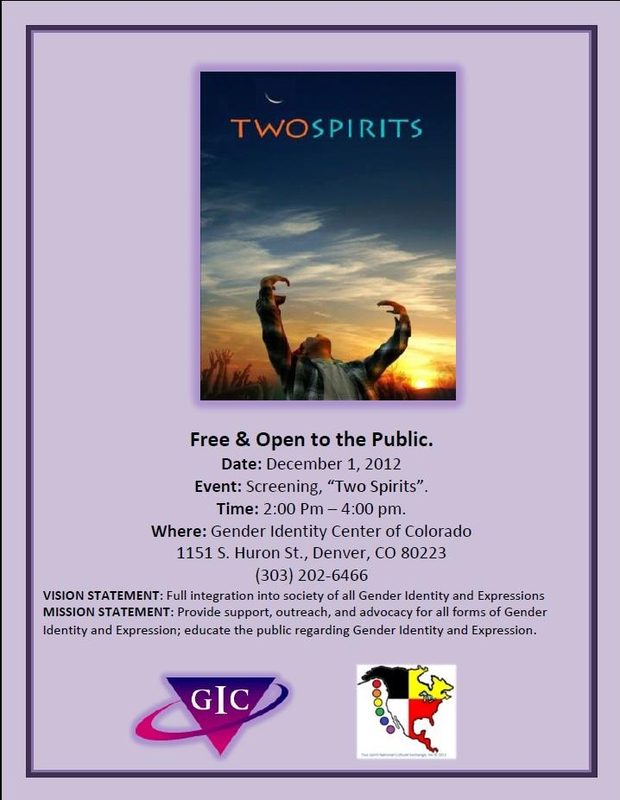 Share this in-depth conversation and enjoy a discussion that is redefining gender and sexuality for many people.